OhMyDosh! is packed full of features for you to earn some extra dosh, although we try to make it as easy as possible to earn a lotta extra dosh, we always feel there's more we can do to help you, so here it is the fully comprehensive guide to making the most of OhMyDosh! As inevitable as the sun is set to rise, we are always adding new offers to OhMyDosh, so unless you sit refreshing the site all day, you’re probably going to miss some of them. Luckily for you, the wizards of dosh have ensured we can let you know about all our latest and hottest offers. We toyed with the idea of visiting our member's houses once a month to update them, but after a little research, we realised that would prove challenging, so here are some ways we’d love to keep in touch with you. Push notifications are awesome, not only can you be told you need to harvest your sweetcorn and that your base in currently being invaded by KiNgMaXwElL95829, but you can also receive OhMyDosh push notifications on both desktop and mobile. Be sure to opt into these; they are definitely the best ways to make sure you don’t miss any hot offers from us! Some offers that appear on site will be limited, so push notifications with definitely help you combat that dreaded FOMO! The first email ever sent was in 1971 and the message read "something like QWERTYUIOP. ", boring right? Well fear not, we shall never send such nonsense to your email address, all you’ll receive is the freshest news from OhMyDosh. This could consist of new offers, competitions or just general news from the most happening place in town, the OhMyDosh HQ. We’ve built in a very handy feature on OhMyDosh which means you can be notified of new campaigns instantly via the 'OhMyDosh messenger' If you’re not sure where this is, just pop to your account and you’ll see it in there! Head over to our Facebook page, click to message us and from there you can subscribe to receive alerts via Facebook Messenger, neat right? 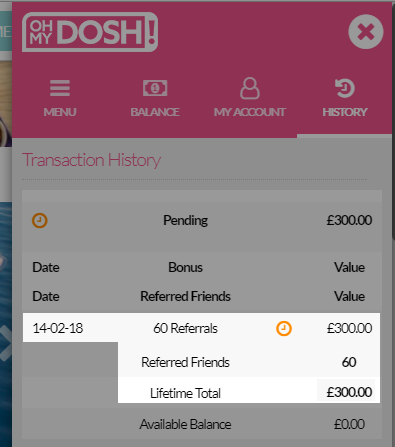 Firstly, don’t worry, we’re not changing the amount we give you lot for spreading the word about OhMyDosh, we’re just making a little clearer for you to see how well your friends are doing on OhMyDosh! 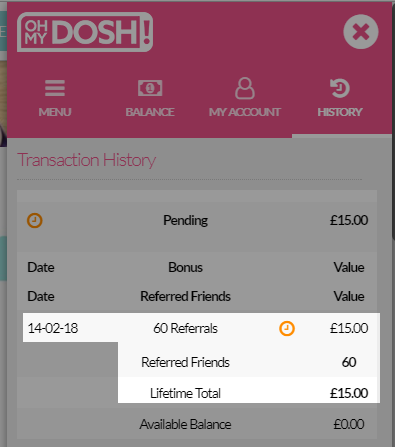 Currently, once you’ve referred someone and they sign up to OhMyDosh, £5 will be added to your OhMyDosh account as a pending balance. Rather than seeing £5 for every person you refer (essentially making this a ‘potential earnings balance’), you’ll see £5 for every person that has gone on to reach their £10 cash out. The £5 will show in your account as pending until your friends balance has become ‘Payable’, at that point the status will also change to Payable for you! We’ve made the change to make it crystal clear to you how your friends are doing on OhMyDosh. You can still easily work out your potential earnings by multiplying the number of friends you’ve refer by 5. We’re always looking at ways to improve the site for you (seriously, I was eating spaghetti bolognese the other night and thought of a great idea! ), but we would love to hear from you, so send us a Tweet and let us know any ideas you have! Valentine’s day, some people dread it and some people can’t wait for it to come around. Still stuck on what to do when February 14th rolls around? Fear not, we’re here to help you out with two foolproof options which are not only sure to impress but also make/save you money too! Everyone loves heading out for a meal, but the bill can soon rack up, luckily we have two great offers which can help keep the cost down. Both Tastecard and Gourmet Society can help you slash the price of your final bill, you’ll find discounts available at restaurants such as; Prezzo, Café Rouge, Frankie & Benny’s and many more! You can save up to 50% at literally thousands of restaurants and nab yourself some dosh from us in the process! Writing as someone who owns a monthly cinema card, I can’t tell you enough how good they are! For less than £20 a month you can see as many films as you like, as many times as you like. So if you want to go and see a film 5 times at the cinema (I’m looking at you La La Land) you can do so without spending a small fortune! Go and see two films a month and you’ve already made up for that monthly cost. They're a great way to keep the cost down when going to the cinema and enjoy all those must-see movies everyone is talking about. Right now on OhMyDosh you can earn £4.35 (saving you about 25% off your first month) if you sign up for an Unlimited Card with Cineworld for just £17.90 a month. If you fancy yourself as a bit of an aspiring chef and love cooking up a storm in the kitchen, then we have some cracking offers for you. Subscription boxes are all the rage right now and rightly so, they are not only convenient, but they are great to get you out of that slump and routine of buying the same thing over and over again. Both Gousto and Mindful Chef are perfect for the budding cook looking to expand their culinary repertoire. Both subscription boxes are currently offering money off your first order with them, so it’s a perfect time to crack out the pots n pans and get cookin’ good lookin’! Now TV appears to have an endless supply of movies to be accessed right from your sofa. Whether you’re wanting a romantic Valentine’s classic or A Horror Slasher film, you’ll find exactly what you’re looking for on Now TV within their 1000’s of movies. As Now TV is owned by Sky, you can watch the latest movies 12 months before other online subscription services and you can cancel your contract at anytime. Take a Now TV 14 day trial and earn £5 for doing so! So there you have it, whether you want to stay in or go out, you can do either whilst making and saving a bit of dosh at the same time!